Anyone traveling to greater Grand Rapids area can find a million reasons to wet a line! The city abounds with areas and locations to fish, both lakes and rivers provide ample places to fish. The city is also surrounded by world class salmon and steelhead fishing areas. 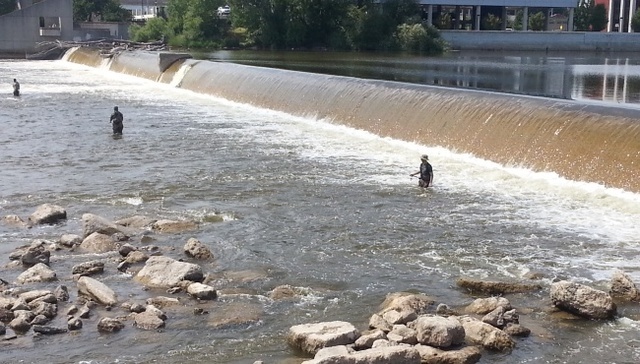 Anglers fish for Steelhead on the Grand River located in Grand Rapids Michigan. Home to the Great Lakes largest migratory run of Chinook, Coho, Lake Run Brown Trout, Lake Trout, and Steelhead. The Grand River has decent wading access below the concrete barrier at 6th street. This area can be waded from the bank or fished from a boat. It offers endless opportunities for migratory Chinook, Coho, lake run brown trout, Lake Trout, and of coarse, steelhead. The best time to fish the Grand and Rouge Rivers is during the Spring and Fall. Another great river is the Rogue, Located less than ten miles from the greater Grand Rapids area. The Rogue River runs right through the town of Rockford. Some of the best places to are under the bike bridge, and behind the paper mill. The Rogue has some great wading opportunities for resident Brown and Rainbow trout. This river has clean, clear water, and offers excellent fishing! Just a little further North, is the Muskegon River. The Might Mo excels in big numbers of Steelhead, Salmon, and resident Trout. Although mostly a private river, the Muskegon also offers great wading and boat fishing. It’s a tailwater fishery and offers the best trout fishing in Michigan.